This utility finds true duplicates (byte for byte check)! CIF doesn't use the unreliable CRC check. CIF is able to check your drives for annoying duplicate files, and provides easy capability of deleting them, saving you megabytes of precious diskspace. Features include added multiple folders and subfolders easily for scanning, show file info under cursor, select identical files manually, by directory or by pattern, automatically leave at least. Check Identical Files - Check your drives for annoying duplicate files. ...... one original. You can also find empty files and (almost) similar named files. An absolute must for people who have a huge number of files, e.g. pictures or mp3. Identicalfiles Check Identical Files New release: CIF 3.2! * Check Identical Files finds similar and almost similar filenames (up to 50% difference)! * Check Identical Files is 100% compatible with the new Windows version, Windows 7! 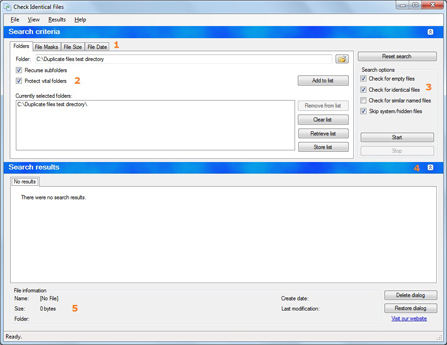 * Check Identical Files has been proven to be THE utility to recover space from duplicate files! * Check Identical Files is the only application that uses new technology which can assure you that every file that is found is really a duplicate! * Check Identical Files is the fastest identical file checker on the market today! * Check Identical Files is downloaded more than 235,000 times since April 2000! Check large MP3 collection effectively for quality and discrepancies. Qweas is providing links to Identicalfiles Check Identical Files 3.2 as a courtesy, and makes no representations regarding Identicalfiles Check Identical Files or any other applications or any information related thereto. Any questions, complaints or claims regarding this application Identicalfiles Check Identical Files 3.2 must be directed to the appropriate software vendor. You may click the publisher link of Identicalfiles Check Identical Files on the top of this page to get more details about the vendor.